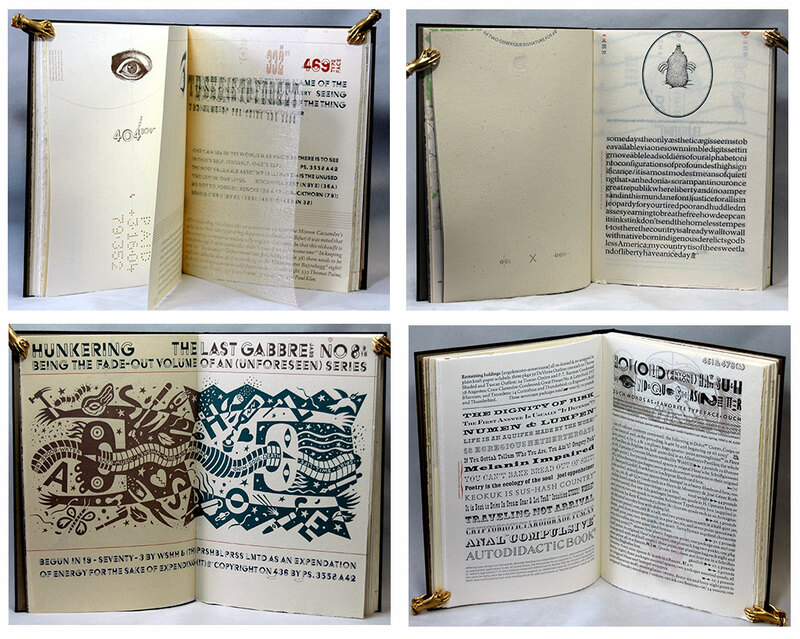 University of Buffalo: "Noted for its fine handmade paper, distinguished typography and unique colophons, Hamady's Perishable Press challenged traditional notions of the book. Over the years, his press has produced a body of work highly sought after by collectors -- books prized for their meticulous and complex physical structures, quirkiness and inventive collaborations between typesetter, binder and illustrator." By Walter Hamady Mount Horeb, Wisconsin: The Perishable Press, 2010. 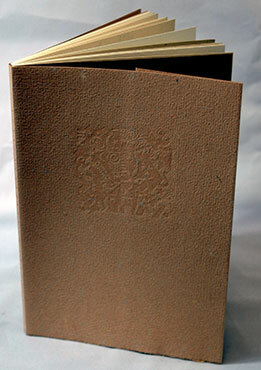 Edition of 80 copies. 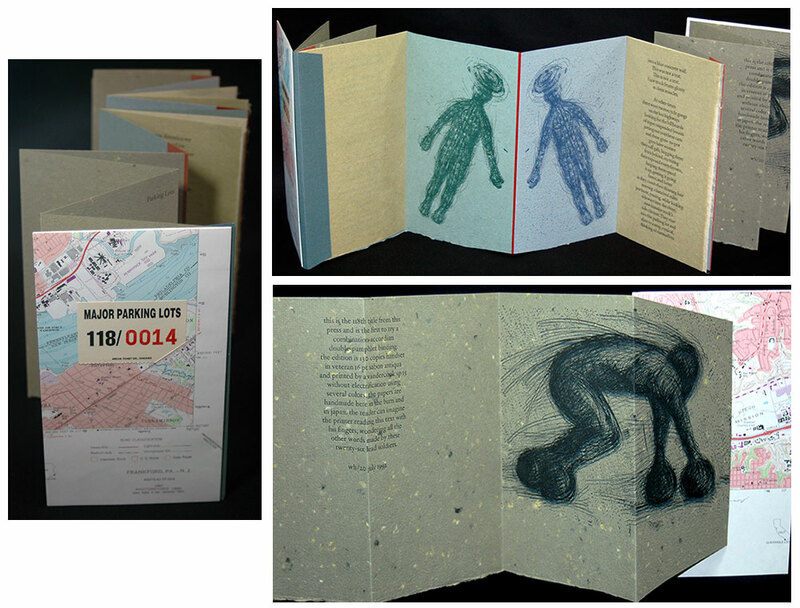 26.5 x 18 cm (10 7/16 x 7 1/8"); 80 page surfaces (76 activated). Letterpress printed. Twenty illustrations by seven artists. Paragon-punched and Hickok-sewn. Press numbered. Signed by Hamady and dated 6 July 2017 on the colophon. Prospectus laid in. Hamady (7/6/1917): "These books ae pristine, as issued by the printer/publisher. Unlike the secondary market they are somehow of a better upbringing." Perishable Press: "Everyone has a timeline, future of it unknown, past usually burred and gone. This partial timeline was gleaned from the journal begun in 1963, continuing forty-eight years to the present. It is a recording of observations made in the quotidian world of day-to-day. Besides having someone kindly to talk to, the attractiveness of writing each morning about the previous day is not merely mind-clearing but mind-emptying as well. "The antiquated printers' cliche 'feeling out of sorts' is long forgotten - sorts being the term applied to any particular character or letters, as distinguished from a complete font. So this book is made up of parts twittering from their own space and time. Sorts desultorily lifted because they seemed prescient, influential, memorable or just plain whimsical. "The pressroom's terminal inventory produced a fine mish-mosh of varigated paper: thick and thin, light and dark, machinemade and handmade, including coup de grace Shadwell - all of which was hand-printed on the single-owner non-electric 1969 Vandercook SP-15. "Certainly little would be discoverable at all but for Anna's stead persistence in transcription (nearly six-thousand pages to date). In fact, this book would not be here except for her gracious stenographic skill and loving, sometimes excited, encouragement." 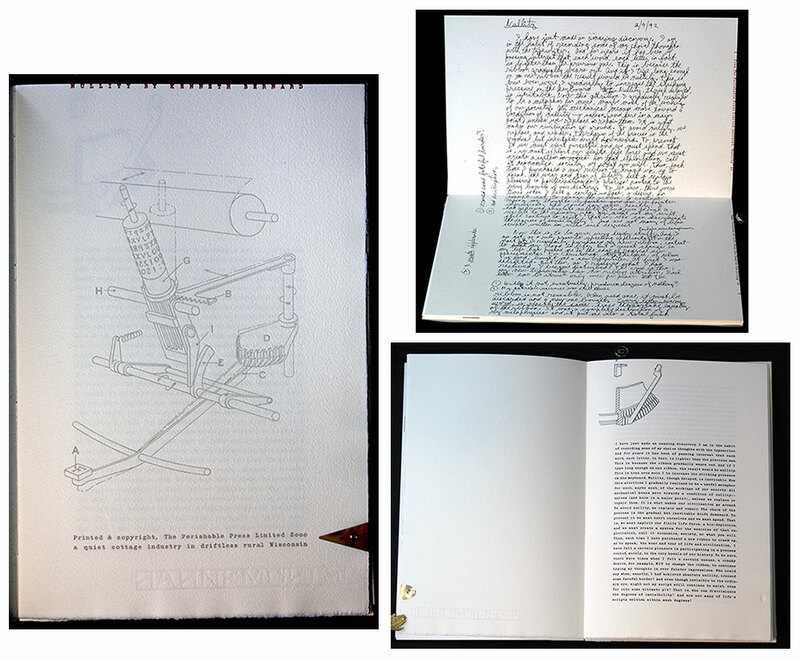 Colophon: "Another vanishing antiquated oddity, like handwriting or penmanship, is the non-electric analog calendar. historically, the aesthetic ne plus ultra has been the Serizawa, produced via the katazome stencil-dyeing technique. This is to point out that in the first signature, various months were laminated via-a-vis to remind of the many calendars simultaneously in use reaffirming an urgent need to know our location in space even though none are exactly accurate. "From a certain standpoint, all these journal entries are like faerie tale crumbs dropped as a retrieving trail through the unknown forest. All these years of sprinkled momentaries contemplating discovery." Mount Hebron, Wisconsin: The Perishable Press, 2004. Edition of 100. 35 x 18 x 0.8 cm (9.75 x 7 x 0.25"); 32 page surfaces (30 printed). Printed in reds, blues, browns, greens, and greys. Titled page calligraphed by the illustrator. Hand-bound by the printer. 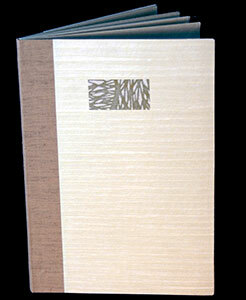 Printed cloth spine with Sugikawa over thin boards. Box certificate on cover reading "Auster-Drescher Container Corp., Hay Hollow, Wisconsin". Press numbered. Signed by Auster and Hamady. Hamady's signature dated "6 VII 17." Juxtamorphing (the) space (in) [catalog for exhibition "Juxtamorphing Space," James Watrous Gallery of the Wisconsin Academy, 7 October through November 20, 2005]: "This is the first collaboration with this author and the third with this artist. As in all creative endeavors, this one, almost Ouija-like, took guidance from the text, including custom-made papers (from Twinrocker and St. Armand) to evoke a corrugated cardboard box. Gill Sans Bold seemed appropriate to the toughness of topic and was reset with paper and copper thins to ease the reader's eye, the opposite effect of Drescher's imagery." Alastair Johnston, "Life & Death in Driftless, Wisconsin": "So often Hamady has used the binding to extend the meaning of the book — such as Auster's Reflections on a Cardboard Box (illustrated by Henrik Drescher, 2004), Perishable's 129th title. It has an entirely calligraphed title-page by Drescher printed in six colors, which has a cover stamped with the kind of seal you see on actual cardboard boxes (the Container Corp in this case is a container of art and ideas)." Paul Auster is an American novelist, essayist, translator, and poet. He has been awarded the Prince of Asturias Award for Literature, the Prix Médicis étranger, an Independent Spirit Award, and the Premio Napoli. He is a member of the American Academy of Arts and Letters, the American Academy of Arts and Sciences, and is a Commandeur de l'Ordre des Arts et des Lettres. Henrik Drescher Wikipedia (accessed 7/16/2017): "In 1967 Drescher and his family emigrated to the United States. Drescher began studying at the School of the Museum of Fine Arts, Boston but quit after one semester to become an illustrator. While travelling in North America and Europe he kept journals of notes and drawings that informed his later work. Drescher's editorial illustrations appear regularly in The New York Times, the Washington Post, Newsweek, Time, and Rolling Stone. He has also written and illustrated several books, including books for children." 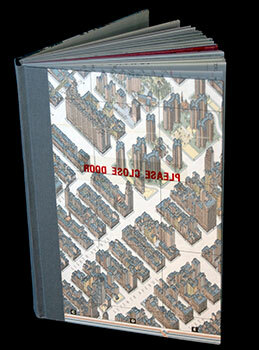 Selected by The American Institute of Graphic Arts for "50 Books/50 Covers 2004 Show." Mount Hebron, Wisconsin: The Perishable Press, 2003. Edition of 107. 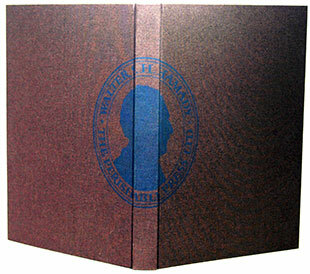 26.5 x 19 x 1 cm (10.5 x 7.5 x .375"); 48 page surfaces (31 printed). Ten images by four illustrators printed in different sizes, some repeated from eleven point dies made in Wisconsin. Handset type in five faces. Printed on/into five different mould-made papers, four German, one French, in several colors. Press numbered. Cased by Scott Kellar in Chicago. Printed cloth over thin museum board. Signed by Hamady on the colophon. Handwritten note by Hamady on the front free end page: "This is one of nine delicious copies sequestered by the printer." 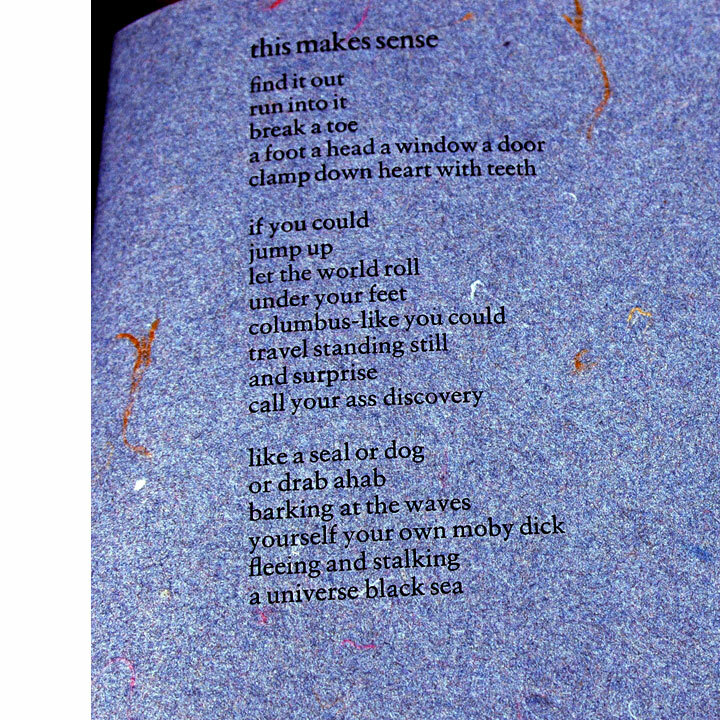 Below this is printed: "David McLimans / 6 August 1948 / 20 March 20014 [sic]. 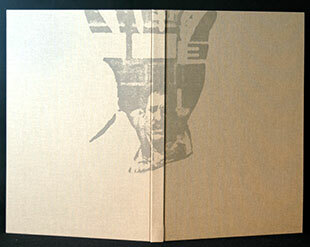 "}Gold seal on back pastedown "American Institute of Graphic Arts Fifty Best Books". Colophon: "Depression Dog is the 128th thin volume from The Perishable Press Limited the eleventh collaboration of author and printer. Ten here in the countryside and one at the once-great university via a seminar which produced READING in 1992. Makeshift it to say that the author's 'segmented loopin' shown in that book became the aegis-engine and raison d'etre of this one. "Inadvertently, the project went fallow while the publisher luxuriously read books all day, every day, for the first six months of 2002, then shamelessly segued to a mad assemblaging of objets trouves for the next five! We finish in time for the author's arrival on Thursday the 93rd day of this year." Toby Olson is an American writer based in Pennsylvania. He co-founded and taught at the Aspen Writers' Workshop, and at Long Island University and The New School For Social Research, and since 1975 Temple University. Mount Hebron, Wisconsin: The Perishable Press, 2001. Edition of 95. 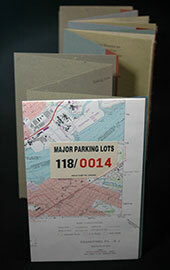 28 x 19 cm (11 x 7 7/16"); 124 page surfaces (103 printed). Letterpress printed in Gill Sans typeface. 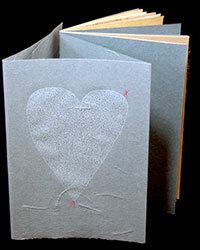 Printed on hand-made and mould-made papers. includes tip-ins, affixations, embossments. Bound in ten gatherings and hand-sewn. Fitted with a folded wrapper printed with an enlarged postal cancellation mark. Signed and numbered. Colophon: "Writing letters is passé in our modern world of e-mail and seems to raise the same eyebrow as mention of NOT having a television set! It is still an elegant way to communicate without intrusion or urgency, directly and quietly into the intended consciousness at a pace neither slow nor fast. "Our perceptive reader will note other anomalies e.g. 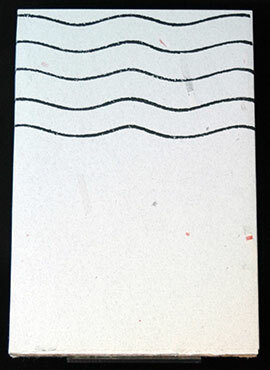 some letters have identical dates or dates too close to make reciprocity through the post office. Which means the letters are crossing which may further imply that one writer doesn't give a hoot what the other has to say - though exchanged ideas to transpire eventually in a delayed syncopation. Also the many aliases usually forged from specificities in the lacunae of text will obfusk the identify of who wrote what. Since these writers seem not to care why should anyone else?" 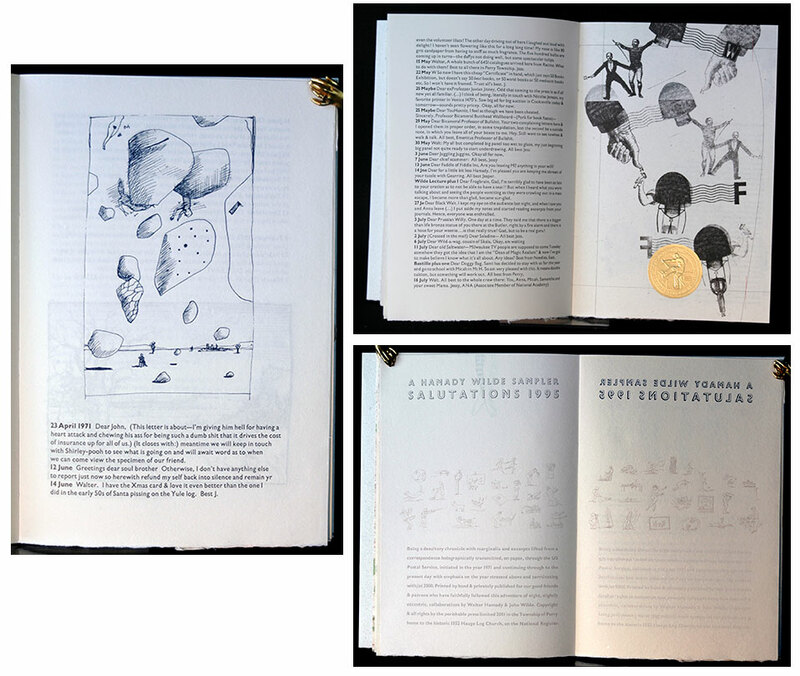 Illustrated by diagrams & admission of structure Mount Horeb, Wisconsin: The Perishable Press, 2000. Edition of 100. 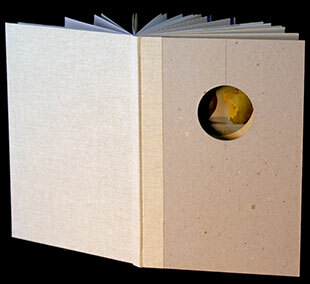 28 x 18.5 cm (11 x 7"); 52 page surfaces (40 printed). Letterpress printed on a Vandercook using several colors. Printed on Evergreen Script, Biblio, and Gutenberg papers. 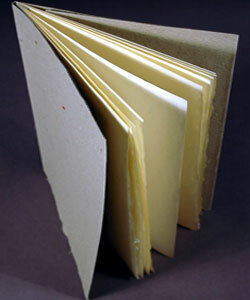 Sewn-boards binding with marbled paper in front and an exposed structure in back. Typewriter keyshaft attached. Press numbered. Signed by author and printer. Prospectus laid in. This copy extra-signed and annotated: "This is certainly a great homerun favorite — Walter Samuel Haatoum Hamady (signed in GUESSAVION [sic] 6 July 2017)"
This is the fourth collaboration of Perishable Press and Kenneth Bernard. Perishable Press: "Another Bernard masterpiece, this one anamorphically mulling life's exigencies via the lensing metaphor of a typewriter. (His) original handwritten text; the first typewritten draft hand corrected; and the first rough setting of a 'typewriter typeface' transmogrify into an ultimate readability." Kenneth Bernard is an American author, poet and playwright. He taught for many years at Long Island University in Brooklyn. Bernard has received Guggenheim, Rockefeller, NEA, HEH, NY Creative Artists Public Service, and New York Foundation for the Arts grants. Mt Hebron, Wisconsin: The Perishable Press, 1999. Edition of 125 (actual 121). 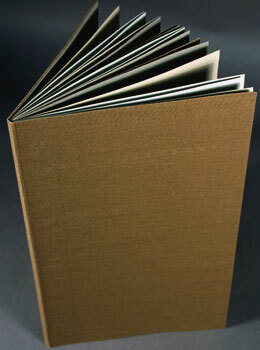 25 x 17.5 cm (9 3/4 x 6 7/8"; 32 page surfaces, 21 printed. Four five-color woodcuts. Monotype Gill Sans reset for effacement with some Gill Shadow Titling for display. Printed on a Vandercook SP-15 on Kurotani takogami paper. Bound by the printer in an adaptation of Gary Frost's sewn boards structure. Unprinted cloth spine with a varia of Japanese papers (including ream wrappers, reversed Serizawa calendar pages) over boards, some bearing metaphorical labels. Signed by the author and binder. Signed on the dedication page by the author. Whitman Sampler is one chapter from the Wiley's sixth novel Commodore Perry's Minstrel Show, which was a prequel to PEN/Faulkner Award-winning novel, Solders in Hiding. Colophon: "Kurotani, according to Aiko's [Art Materials Import, Chicago], is a takogami or kite paper which has been handmade for twenty generations. Unfortunately it is no longer able to be produced, an extinction of a species. Cherishingly, to save and utilize, each sheet was folded and halved with a large knife to get page size au naturel with no accommodation for fore-edge swell. Of course the illustrator consulted the woodcuts of the time-period of the story so Ukiyo-e (the floating world) allusion is not coincident. Printing these many (twenty-some-odd) colored illustrations was an adventure new and exhilarating!" Richard Wiley is an American novelist and short story writer. His first novel Soldiers in Hiding won the PEN/Faulkner Award for Fiction. He is a graduate of the University of Puget Sound with an MA from Sophia University in Tokyo. He has been a professor of English at the University of Nevada Las Vegas since 1989. In 2005 he was inducted into the Nevada Writers Hall of Fame. Jim Lee received an MFA in printmaking from the University of Wisconsin-Madison in 1980. 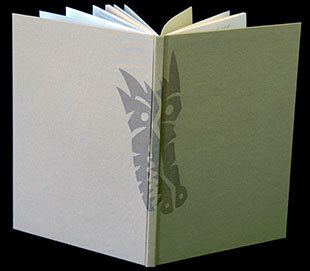 He began making limited edition letterpress books under the name Blue Moon Press in 1978. 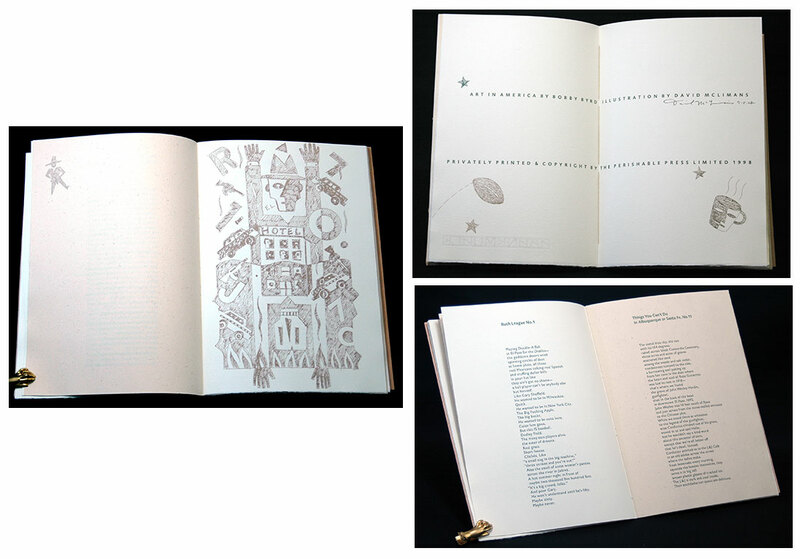 Whitman Sampler was selected by The American Institute of Graphic Arts for "50 Books/50 Covers 1999 Show." Mount Horeb, Wisconsin: The Perishable Press, 1998. Edition of 117. 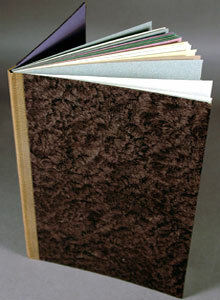 26 x 18 cm (10.25 x 7.125"); 48 page surfaces, 35 printed. Printed from Gill Sans and Syntax moveable types on hand-trimmed Hahnemühle Biblio and Gutenberg papers. Bound in Shadwell Crudité handmade paper. Signed by Hamady on the colophon. Signed by Bobby Byrd on the dedication page. Signed by McLimans on the title page. Handwritten note by Hamady on free end page designating this as "one of eleven copies kept in tissue upstairs since publication by the printer publisher binder." Walter Hamady:"Probably this book has been in the making since our mutual friend Paul Blackburn (1926-1971) made the awareness. The title poem came as spark and the illustration as kindling for collaboration." www.overdrive.com: "Bobby Byrd—publisher, poet and essayist — is the co-publisher of Cinco Puntos Press in El Paso, TX. In 2005, for their work as publishers and for their involvement in the cultural communities of Mexico and the American Southwest, he and his wife Lee Merrill Byrd received the Lannan Fellowship for Cultural Freedom. As a poet Byrd is the recipient of an NEA Fellowship, the D.H. Lawrence Fellowship awarded by the University of New Mexico, and an International Residency Fellowship (NEA/Instituto de Belles Artes de México)." David McLimans (1948-2014) was a graphic artist and an editorial illustrator. He was recognized by awards including the Society of Newspaper Designers Award of Excellence, Print Magazine's Certificate of Excellence, the New York Times Illustrated Book of the Year. Mount Horeb, Wisconsin: The Perishable Press, 1995. Edition of 125. 25 x 17 x 1 cm (9 7/8 x 6 3/4 x ½"); 102 page surfaces with 78 printed. Letterpress printed. Different papers used from Europe & Japan as well as paper handmade by Hamady's elder daughter in Wisconsin. 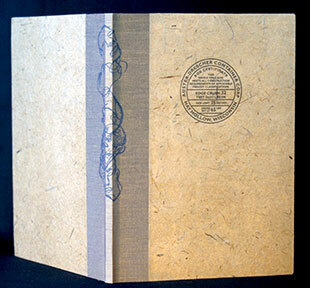 Bound in chipboard with front board lacking linen cloth that covers spine and back board. Circular cutout on front board reveals a portion of a reproduction of a John Wilder painting ("Two golden delicious, one bitten"). Numbered by blind emboss on the colophon page. 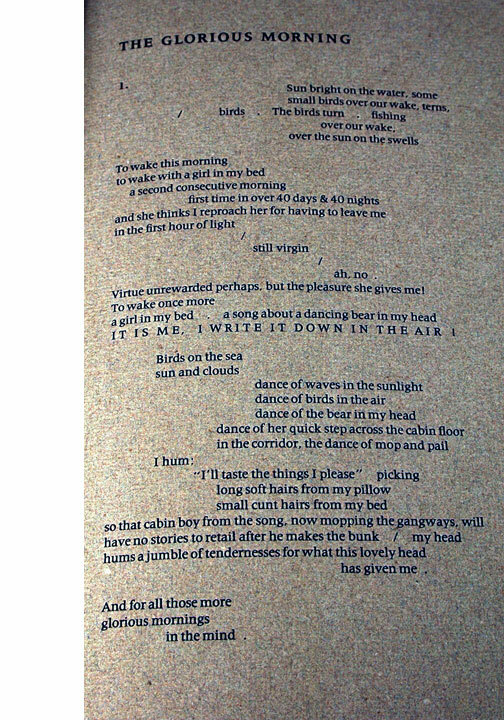 Justamorphing (the) space (in) exhibition catalog (James Watrous Gallery of the Wisconsin Academy, 7 October through November 20, 2005): "Thirteen paintings by John Wilde, twelve poems by Reeve Lindbergh: a book ostensibly for children, especially those of well-to-do graphic designers. 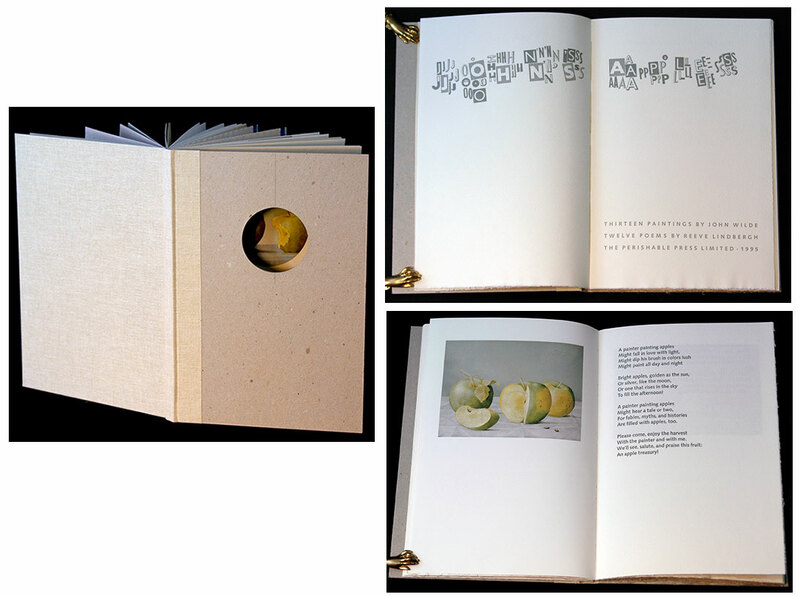 This book physically and visually shows how books come to be, from ideas to alphabets to words and pictures in an unshrouded bound structure. As usual, this book breaks new ground in the genre in ways anathema to chaste bibliopundits. To the receptive mind it should evoke pleasant contrasts between the measured austere and playful parameters essential to our child's eye. "Again, the press-numbered edition ... juxtaposes the antiquated technology of hand printing with the state-of-the-art six-color Heidelberg. Machine, hand, eye, heart, and mind are intermixed in a very unusual revelation of process." Reeve Lindberg, the daughter of aviator-authors Charles A. and Anne Morrow Lindbergh, is a writer of personal stories and children's literature. Her work has appeared in a number of periodicals and magazines including The New York Times Book Review, The New Yorker, and the Washington Post. John Wilde (1919-2006), Wisconsin Visual Artists website [accessed 7/12/2o17]: "Wilde was well-known as a painter, master of silverpoint, occasional printmaker, renowned draftsman, illustrator, and sometime writer. Many readers probably studied with him at the University of Wisconsin-Madison where he taught from 1948-1982 (two of his most well-known students were Bruce Nauman and Wynn Chamberlain). For over sixty years, Wilde's paintings and drawings have been among the most powerful, startling, and gorgeous objects to emerge from Wisconsin. Wilde remained in Wisconsin and helped shape the state's cultural identity. "Yet Wilde was never simply a Wisconsin or Midwestern artist. His work is among the strongest of his generation and its impact on American art is only now beginning to be assessed by a generation of art historians rethinking modernism." Among the paintings by Wilde in John's Apples are "Five early redbirds"; "Two apples of love"; "Four Dolgo crabs"; and "Two Thalman sweets with a hinder light." Mount Horeb, Wisconsin: The Perishable Press, 1991. Edition of 125. 20.5 x 13.5 cm (8 x 5.5"); 40 page surfaces, 31 printed. Printed on papers made of recycled cellulose. Printed in 9 colors in 46 press-runs. Signed by Walter Hamady on hip tag. 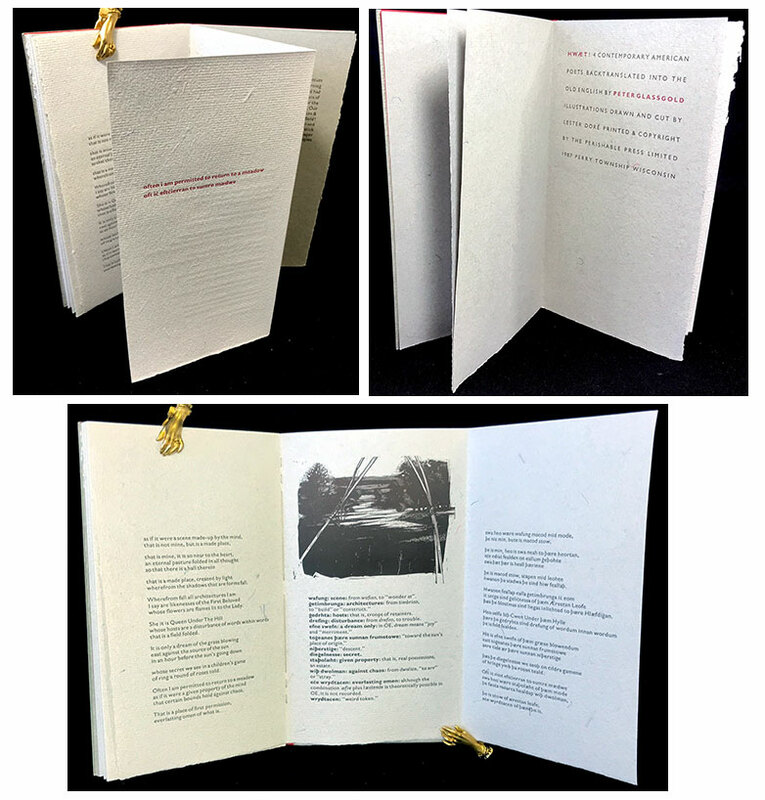 Perishable Press: "Six poems ... printed on/into four different colors ... 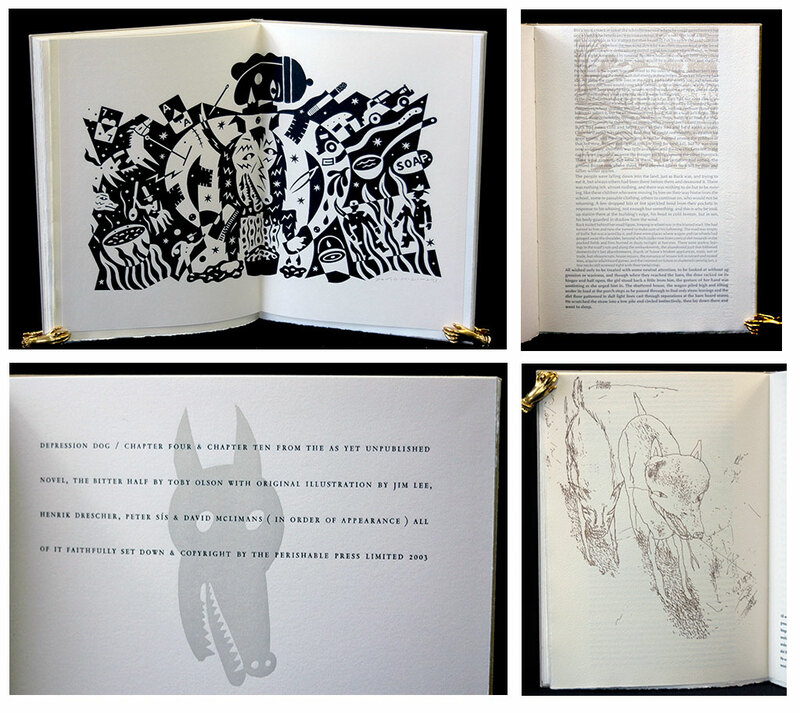 The book has three maze-drawings in the shape of a heart and the profile of the author and his wife to whom these poems are addressed. There are numerous fleuronic adventures throughout accomplished in forty five press runs. Some enhancement of the text is through the use of shorthand and Russian Reliable hip tags number the edition." As John Wilde said to Walter Hamady, Of Boulders & Bolides was/is "Walter's love book for Anna." Walter says, "He is/was correct!". Olson Mount Horeb, Wisconsin: The Perishable Press, 1991. 26 x 17.5 cm (10.25 x 7"); 44 pages. Machine set, then re-set and paper spaced by hand. Gill Sans printed on/into handmade Shadwell papers in green, black, red, brown, blue changing to burnt sienna and two split fountains. Fourteen hand applications of notches, pencil, ponce-wheel, etc. Three signatures sewn to a folded guard which backfolds over a wooden hollow spine supporting a horizontal bi-paper cover. Signed by the author. Front cover individually collaged by the printer. Numbered. Signed by Hamady in pencil on free end page. A chapter from Toby Olson's novel "Dorit in Lesbos" published in 1990. Olson, born 1937, is an American novelist. He co-founded the Aspen Writers' Workshop in the mid-sixties. Mount Horeb, Wisconsin: The Perishable Press, 1987. Edition of 110. 25.5 x 13.5 cm (10 x 5 3/8"); 46 page surfaces, 27 printed. Handset in Gill Sans with the special Anglo Saxon characters manufactured by Paul Hayden Duensing. Printed in black and red on Shadwell paper. 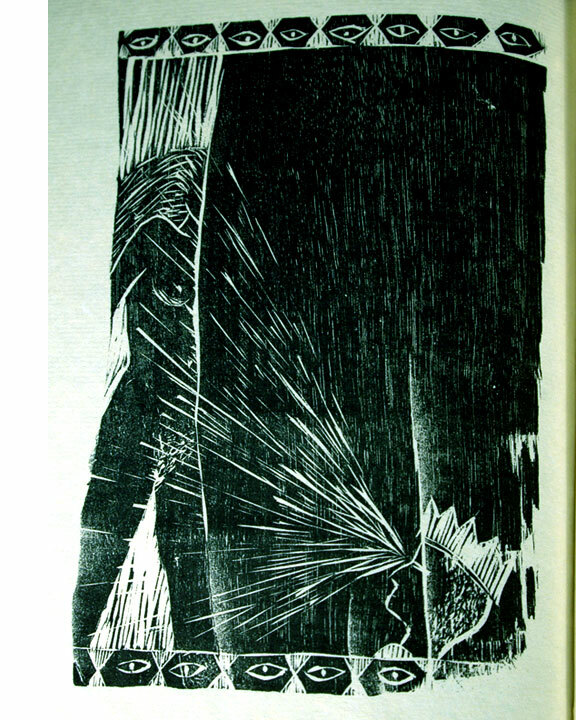 Illustration by Lester Dore consists of one line drawing and one wood engraving printed directly from the block. Binding by Marta Gomeaz. Signed by Hamady on the last page of print. Four post-modernist poets, back-translated into the Old English of Beowolf times. Printed on fold-out pages revealing the poem, the notes, the back-translation side by side by side. Exposed sewing to the paper cover with a red flyleaf which is also folded as a guard that appears front and back. Walter Hamady, Colophon: "To translate from current times backwards a millennium or so seems like atavistic outré. It is collectively learning our past via our children. Bringing this book forward had much help and deliverance." Peter Glassgold, Introduction: "Free verse ought to be free from the bounds of traditional forms and arbitrary language and the need of set classical allusions for meaning. Let the sense of the poem be carried purely in its words. "Theoretically, poems with such purity of language should be easily translatable. Could they even be translated back in linguistic time? I became curious to find how some of my favorite poems in the modernist mode might sound in the English of a thousand years ago. "The translations here do not draw on the Old English poetic tradition, which was highly stylized. I have tried for the most part to use what seems to me must have been words in everyday speech. Where they were lacking in the historical record, I made them up." Poets translated for Hwaet! are Jerome Rothenberg, David Antin, Toby Olson, and Robert Duncan. www.wikipedia.org (10.25.17 access): " It is often acknowledged that Hamady's artist's books have become even more extraordinary since 1973, when he embarked on a curious series he calls The Interminable Gabberjabbs. In these effusive, almost boundless books, which are now widely collected, he made strange, satirical use of disturbing Surrealist strategies like free association, found imagery, and the radical juxtaposition of advertising ephemera. Throughout that series (there are eight gabberjabbs), he pokes fun at nearly everything, including his own artistic seriousness, the snobbery of those who claim to be scholars, and the widespread, unchallenged assumption that traditional page layout and, particularly, typography, are governed by immutable rules. Augmented by Henrik Drescher, Patrick JB Flynn, David McLimans, Peter Sis, William Stafford, and John Wilde. Mount Hebron, Wisconsin: The Perishable Press, 2006. 26 x 18.5 x 2cm (10.25 x 7.125"); 160 pages. Letterpress printed. Handsewn and bound in Chicago by Scott Kellar. Bound in Italian burnt umbrian cloth over boards with a rondelle/cameo (of the printer) over the spine in a dark Delft blue. Signed and numbered on the front free end page by Hamady. Walter Hamady: "Here is the fade-out volume of an unforeseen series begun in 1976. It was printed on our single-owner Vandercook SP-15 in more than 285 press-runs, utilizing a numerosity of colors, typefaces and papers — hand, mould and machine made. In addition to the usual lay-ons of languid letterpressing there is an affluence of unorthodox applications. 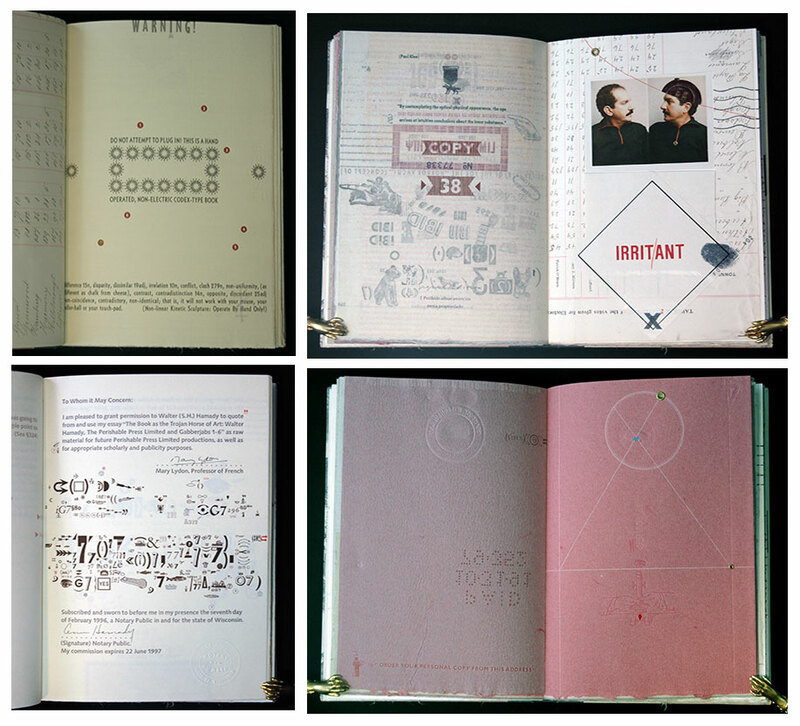 This volume has been collaged, perforated, notched, rubberstamped, drilled, ticket-punched numbered, signed, grommeted, scribed, ear-tattooed, ponce-wheeled, time-clocked, dog-eared, embossed, shorthanded, corner-rounded, elliptically trimmed and three genuine studs. In addition, there are 79 illustrations." Colophon: "Hunkering is a symbolic attitude akin to the turtle's pull-it-all-in. If done properly, can segue to levitation and invisibility (the ultimate form of self-effacement). From this versatile station we can travel through those infinite journeys to the lacunae of déjà vu. For more than fifty years the modus operandi has been the above, interjaced [sic] with the earthworm alluded to at the beginning of this tome. Pursuant to this: 'The book a tunnel of space without specific gravity wherein we can swim, float, spin, bump – the works.' Wednesday 9 November 1994 We have been spelunking in this 163-page segment since 20 April 2003 and should reach self-sufficiency by Memories Day, 29 May 2006, then to Scott Kellar in Chicago for binding." Mount Hebron, Wisconsin: The Perishable Press, 1996. Edition of 125. 264 x 184 x 20mm; (10.25 x 7.25 x 0.75");; 600 grams (1.25 pounds); 154 page surfaces. Printed, collaged, rubber stamped, drilled, notched, pigment patterned, (ticket) punched, numbered, signed, grommeted, scribed, ear tattooed, drawn, camouflaged or timeclocked. 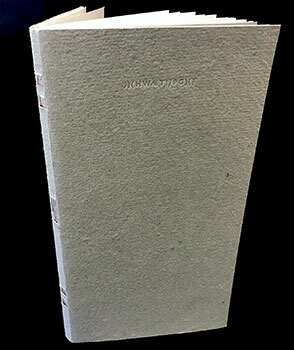 Hand-hard-bound by the printer/publisher with a varigated cloth spine, some printed with an anatomical spine diagram. Various old maps over boards, some obviously worn by time and use, no two alike. This copy signed and annotated by Hamady on front pastedown: "No two exactly alike — don't worry this extra note done in macular-degeneration 'Guess-a-vision' scribed by Walter the Hamady 6 July 2017". "The abnormally short colophon states that the edition is 125 copies employing an unthinkable number of press runs, typefaces, ink colors, papers (hand, mould and machine-made) and a plethora of odd applications. Each copy is numbered at least nineteen times and signed ten. 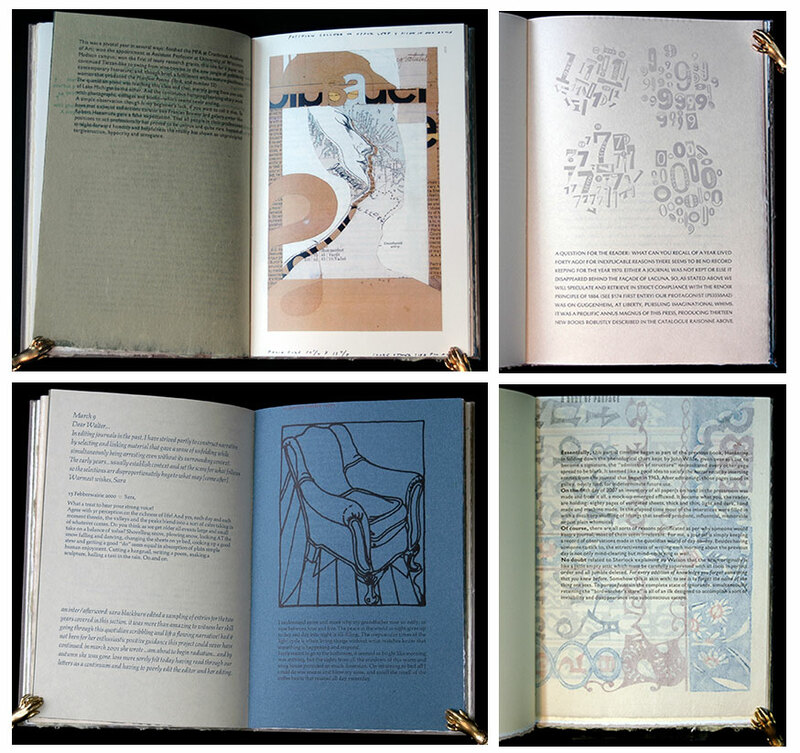 it may be the first Private Press book Timeclocked to enrich provenance and demonstrate 'performance' aspects. Also (it) may be a first ever to use the colophon as a job-searching want-ad and may be in contention for the longest, non-fawning dedication in the history of the book form." 11.25 X 7.5"; 36 pages. Illustrations by Ellen Lanyon. Bound by Bill Anthony. 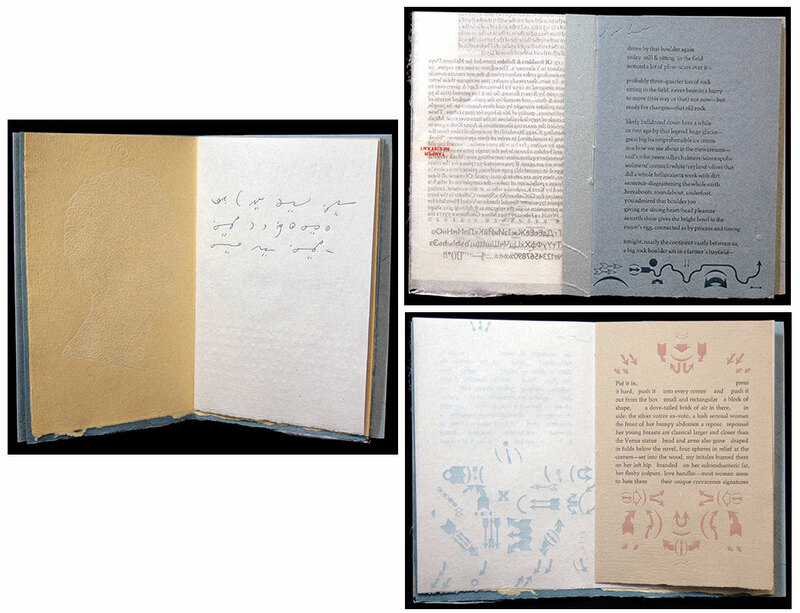 Page one is on leaf which serves as front paste-down. These are poems about preparing foods as well as the cooking, the eating, and the drinking. 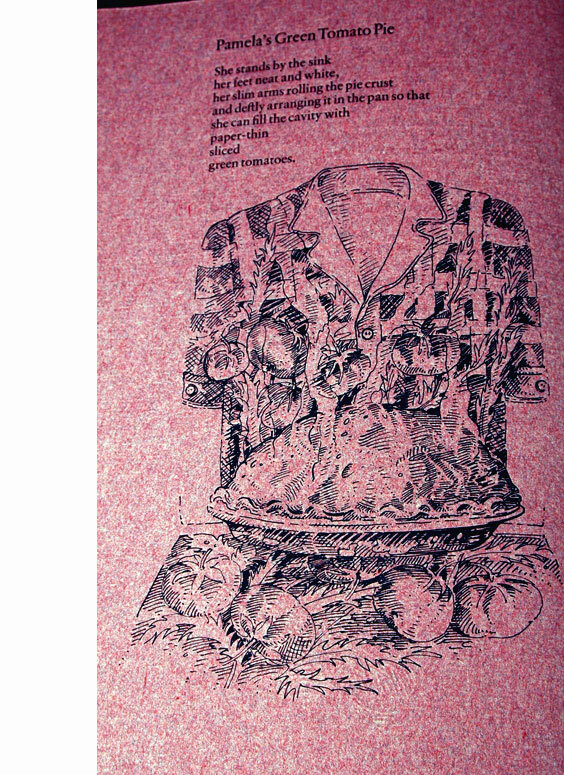 Papers were made to correspond to the color of the food in the poems. 'Making a Sacher Torte" is a sequel to the 1974 "Wandering tattler," but replacing birds with food, cooking, eating, and drinking. Contents: Having replaced love with food and drink; Breakfast; My Mother's Milkman; Making a Sacher Torte; Pamela's Green Tomato Pie; Saturday Night; Ode to a Lebanese Crock of Olives; Sally Plum; Coprinus Comatus: Evening Mushrooms, Morning Milk. 26 cm; 10 leaves with one illustration. Letterpress printed by Walter Hamady on handmade Bodleian. Sewn in two signatures onto a handmade paper wrapper of Shadwell made by Hamady. Woodcut by Scobey. Mary Laird: "Joel came to the farm and thrilled the Hamady children by making wonderful faces. They tried to imitate him." 13 X 7.5";  leaves. Binding by K Kuehn with help from Mary Laird. Poems culled from the "journals" left in manuscript form at the author's death in 1971 by Robert Kelly, who edited them for publication by the Black Sparrow Press in 1975. 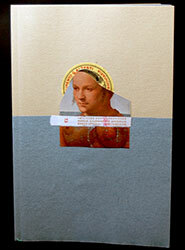 All but one poem were previously published in Sixpack, no. 7/8, 1974. "Paul was a poet's poet. He died young, 43 or 44, cancer of esophagus. He said he had a premonition." Mount Horeb, Wisconsin: The Perishable Press, 1992. Edition of 130. 23.5 x 13.9cm (9.25 x 5.5"); 28 page surfaces, 21 printed. Handset in Sabon Antiqua. Printed on/into Shadwells and Japanese papers in several colors. 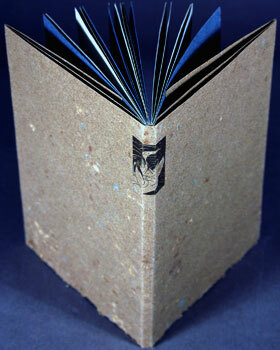 Concertina binding with pamphlet stitch inserted into .4 mm aircraft plywood boards covered with USGS quadrangles. Signed by the poet at the end of the poem. Signed by Hamady on the back cover. (Last 2 copies). Perishable Press: "The text is a single narrative poem that begins in Philadelphia and travels to San Diego. It is insightfully American. ... boards covered with actual USGS quadrangles sporting an actual parking lot ticket manufactured for this occasion (and effectively 'press-numbers' the edition)." Wikipedia (accessed 10/25/17): "Clarence Major is an American poet, painter, and novelist; winner of the '2015 Lifetime Achievement Award in the Fine Arts,' presented by the Congressional Black Caucus Foundation. He was also awarded the 26th 'Annual PEN Oakland Lifetime Achievement Award 2016' on December 3, 2016." 8 x 5.5" 28 pages. Frontispiece by Janet Morgan. Paper made by Mary Laird. 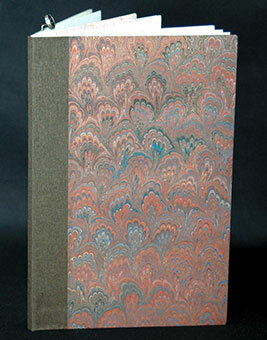 Bound in brown Shadwell made especially for the book using "cattails from a nearby marsh." Printed in gray, blue and black on blue, gray and off-white Shadwell paper. Poet's only published work. Walter Hamady (Two Decades) referring to Arthur Brown: "His early and untimely death ... took a genuine powerful voice away from us all and I think of that loss often."